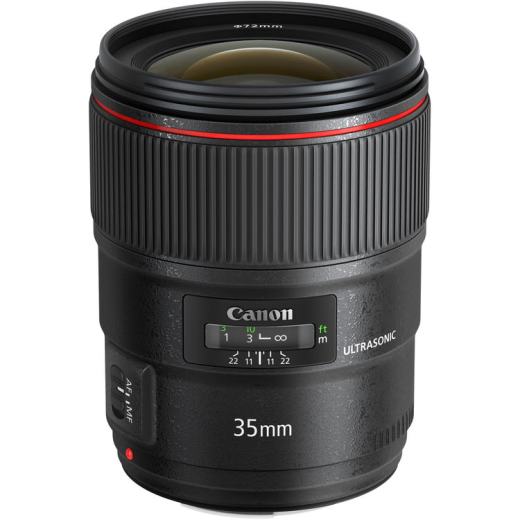 The EF 35mm f/1.4L II USM from Canon is an L-series prime wide-angle lens featuring Blue Spectrum Refractive Optics and a maximum aperture of f/1.4, making it ideal for shooting in low-light situations and for controlling depth of field. Two aspherical elements and one Ultra Low Dispersion (UD) element combine with the BR element to control chromatic aberrations and color fringing for increased clarity and sharpness. A Subwavelength Coating has also been applied to reduce ghosting and lens flare for greater color accuracy and contrast. The Ultrasonic autofocus motor (USM) provides fast and near-silent AF operation. Full time manual focus override enables precise manual focus even when in AF mode.